I think this one is pretty easy. Maybe we should have mixed up the letters more. 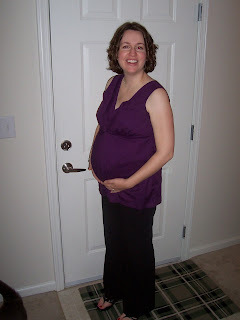 And, for a bonus, here's a not great picture of me at 32 weeks (taken on Sunday). Oh, and we're still praying to finalize things with the buyer for our house. We've verbally accepted an offer, and are very anxious to get something on paper. (Of course, we've been here before, and it's fallen apart...) I'm just praying for God's will. That is good news, we will keep praying.